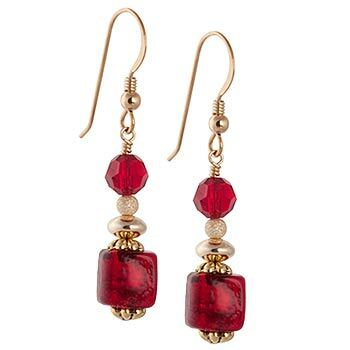 Beautiful authentic Murano Glass Earrings with Swarovski Crystals. Red Murano glass encases 24kt gold foil giving it a warm glow. The findings are gold plate or gold fill with gold fill earwires. They are lightweight and measure 40mm (about 1 1/2 inch) top to bottom.